Introducing our newest creation, the The Black Widow Cobweb Shooter features a UL listed, 200 watt, hot glue gun with a four finger ergonomically designed trigger. This glue gun makes shooting webs an easy, nonstop affair and is capable of shooting 6-7 pounds of cobwebs per hour. However, the main story is in the design of the airline assembly. 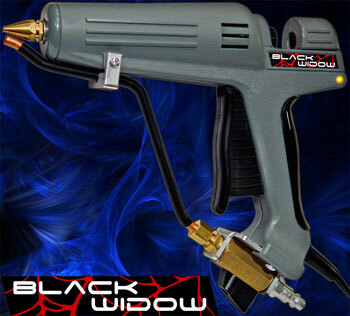 The Black Widow has a unique modular design which allows us to fabricate an exceptionally versatile cobweb shooter without heavily modifying the glue gun as our competitors do. This means we can produce a pro-level cobweb shooter at an incredibly low price. Introducing the industries only illuminated full moon prop, i-Zombie Moon. No haunt would be complete without this most common of Halloween symbols. 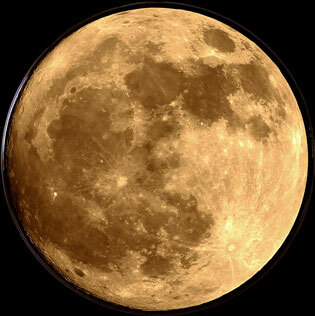 Our 25½ inch diameter Moon is the perfect addition to your cemetery scenes. Built tough, they may be used indoors as well as outdoors. Besides the obvious use for all things haunted, some of our Moons are casting their eerie glow in home theatres, dens and bedrooms. Plugs into standard 110 volt outlets. Click on the Moon for more info. Whether you are a collector of the unusual or involved in your own dead tissue re-animation project, this may be just what you are looking for. i-Zombie Productions is offering a very limited number of these hand crafted, movie quality props this season. 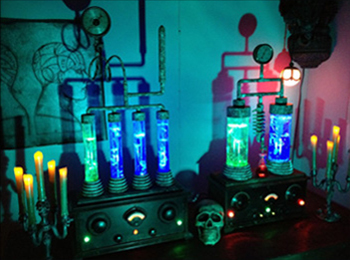 Bring your lab scene to life with one of these incredibly realistic laboratory props.